La Femme allover beaded gown. 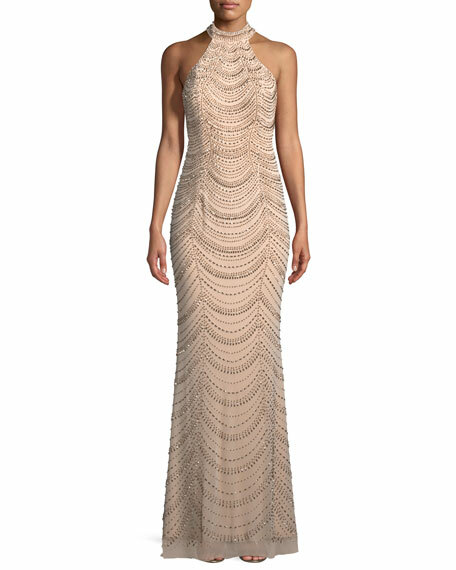 Badgley Mischka crepe evening gown with ruching at side. Off-the-shoulder, sweetheart neckline. Short flutter sleeves. Trumpet silhouette. Hidden back zip. 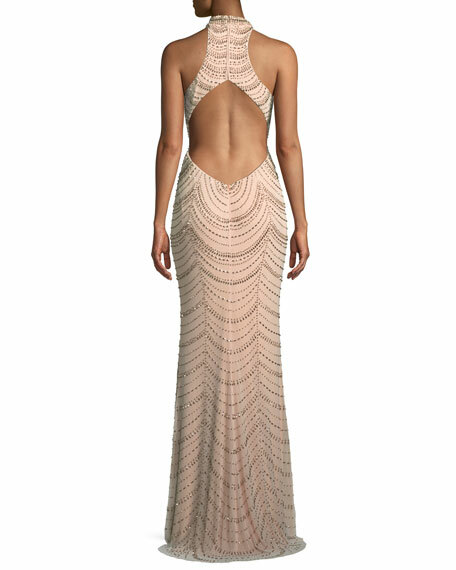 Badgley Mischka crepe evening gown with ruching at side. Off-the-shoulder, sweetheart neckline. Short flutter sleeves. Trumpet silhouette. Hidden back zip. Floor sweeping hem. Shell and lining, polyester. Dry clean. Imported. Model's measurements: Height 5'11"/180cm, bust 33"/84cm, waist 24.5"/62cm, hips 34"/86cm, dress size US 2. Naeem Khan evening gown with beaded-embroidered top. Plunging V neckline. 3/4 sleeves. Peplum waist. Trumpet silhouette. Hidden back zip. Train hem. Nylon; skirt, viscose/spandex. Made in USA of imported of Italian materials. Model's measurements: Height 5'10.5"/179cm, bust 32"/81cm, waist 25"/64cm, hips 35"/89cm, dress size US 2/4.